This is a Natural Facial Toner made with Organic Plant Extracts. This product does not contain any mineral oils, animal oils, synthetic colors or fragrances. 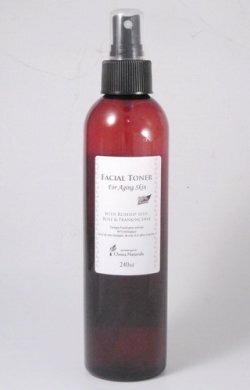 Our Facial Toner is 83-89% Organic, and contains Rosehip Seed Essence, which has various nutrients including Vitamins and Essential Fatty Acids to soften, soothe, and nourish your skin. Rejuvenating Rose Water and a variety of essential oils, including Frankincense, Helichrysum, Carrot Seed, Lavender hydrate and revitalize your skin, and prevent from lines and wrinkles. How to Use: Twice a day, after using our Cleansing Cream, spray Facial Toner on your face, and pat with your hands gently. Or damp cottons with Facial Toner, and pat gently, followed by our Moisture Cream.